'Into The Badlands' will premiere Sun. Nov 15 at 10pm e/p. 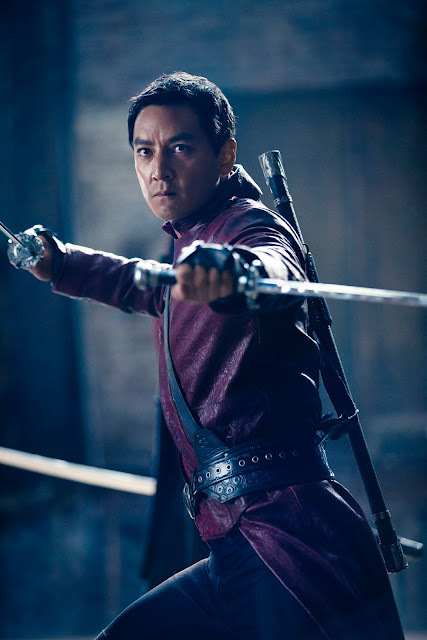 In a land controlled by feudal barons, “Into the Badlands” tells the story of a ruthless, well-trained warrior named Sunny (Daniel Wu) and a young boy named M.K. (Aramis Knight) who embark on a spiritual journey across a dangerous land. From AMC Studios, the six-part series is created by executive producers/showrunners/writers Alfred Gough and Miles Millar (Shanghai Noon, “Smallville”), and executive produced by Oscar®-nominated producers Stacey Sher and Michael Shamberg (Pulp Fiction, Contagion), director David Dobkin (Wedding Crashers, Shanghai Nights), fight director Stephen Fung (Tai Chi Zero, House of Fury) and Daniel Wu (Tai Chi Zero). “Into the Badlands” stars Daniel Wu (Tai Chi Zero) as Sunny; Marton Csokas (The Lord of the Rings: The Return of the King) as Quinn; Aramis Knight (The Dark Knight Rises) as M.K. ; Oliver Stark (“Luther”) as Ryder; Emily Beecham (28 Weeks Later) as Widow; Orla Brady (“Dr. Who,” “Fringe”) as Lydia; Sarah Bolger (“Once Upon a Time,” “The Tudors”) as Jade; Ally Ioannides (“Parenthood”) as Tilda; and Madeleine Mantock (Edge of Tomorrow) as Veil.